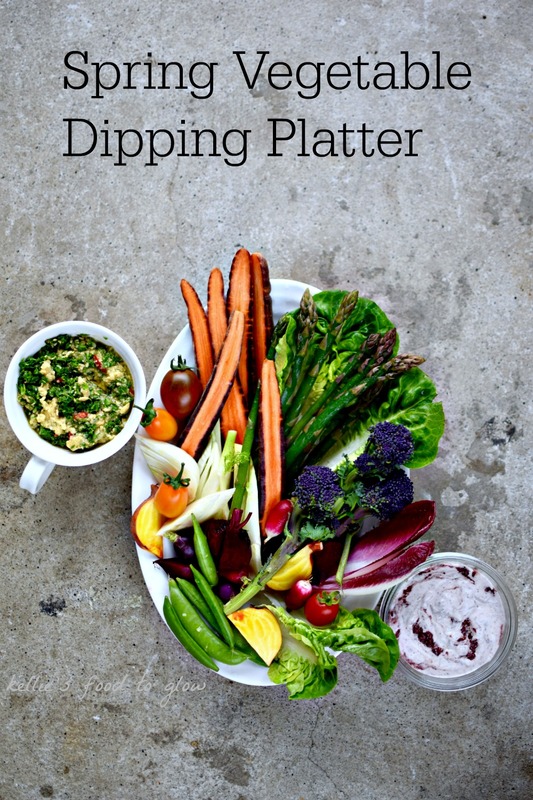 A raw vegetable platter is my excuse for indulging in some creamy, zingy, quickly-made dips. Of course there are pitta chips, but mainly it is about – at least today – the freshest veggies I can get my greedy hands on. I procured most of my produce from a local organic shop, but I am an absent-minded enough gardener to have only just spotted some over-wintered beetroots still hanging around in one of my raised beds. I don’t have a big garden so I’m not really sure how I managed to miss them all of these months. But I’m glad I did as I divided them between two recipes, the first of which I am posting today. This simple recipe is a kind of two for one, with two simple dips outlined – and really just cleaned up and bright fresh crunchy vegetables of your choice to dunk. But don’t confine the dips to just vegetables and pitta chips: the chimichurri-style bean dip goes great with sauteed planks of tofu and roasted veggies (see below), as well as soft and baked falafels (recipe coming soon); the vegan black olive tapenade mayo is of course completely at home as a sandwich spread. Although I love the smooth sophisticated taste and texture of the ebony-streaked aquafaba mayo, I recommend especially the chimichurri dip for those of you favouring flavours that smack you around the chops a bit. Subtle it ain’t. My change from the usual herbs, vinegar, oil and garlic concoction is to make the chimichurri with good sherry vinegar and to tone down the garlic. I know: I am toning down something. Alert the media! The spiky flavours of the chimichurri dip deserve several outings, so make enough (double) to go with things like falafel, over omelettes, on sauteed tofu and roasted veggies, and over pan-fried or baked white fish. It’s great stirred through grains too. Put the herbs, garlic and vinegar in a small food processor bowl (e.g. a mini chopper) and pulse until mixed put not smooth – you still want texture. Pour the mixture into a jug and stir in the rest of the ingredients, adding salt and pepper to taste. The bean dip will last for five days in the refrigerator. Stir together/blend half a quantity of vegan aquafaba mayo OR 1/4 cup best quality prepared mayonnaise, with a squeeze of lemon + 2 heaped tsp black olive tapenade. Gorgeous photographs! This would be perfect for a summer backyard barbecue.. people never think of vegans and veggies at a barbecue! The bean dip sounds delicious! I will have to try it! Lovely crunchy bright colours, delicious! You have actually transported me straight back to our many summers in Brittany as a child where we always started our meals with a big huge bowl of crudites with a vinaigrette dip – fast forward at least 40 years and you have given us a new stylish, sophisticated and contemporary version which I will certainly be doing, thank you! I LOVE veggie crudites! My favorite types of dips are a thick creamy hummus, sweet chili, fresh guacamole and mango chutney, but I’ve always wanted to try babaganoush! This is such an amazing recipe for both one person for a meal or to share as a giant party platter! If I’m going to be completely honest, raw veggie platters don’t entice me as much until I see what zesty, rich and creamy dips they’re paired with. So when I saw this chimichurri bean dip I was sold. I’m always making a version of chimichurri and love to whip up quick bean dips so I love that you’ve combined the two sauces. This looks so fresh ! Thanks for sharing. Im getting back on the real real clean eating so I shall start here! That looks really healthy and delicious!